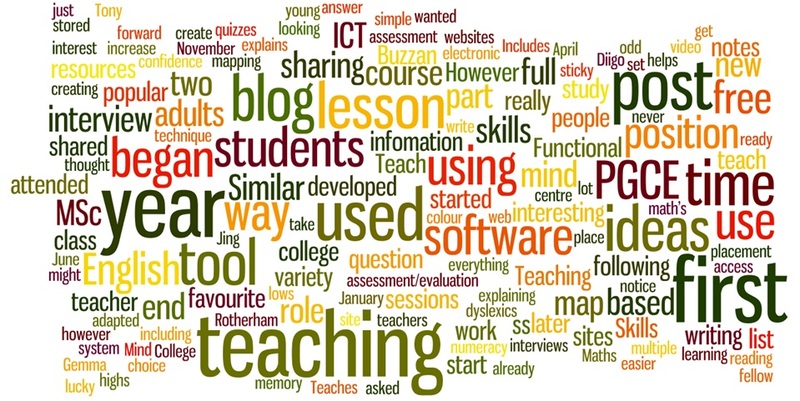 Following on from last week’s retrospective post ‘From trainee to tutor’ I thought it would be fun to create a word cloud of this year’s blog posts. As I used Wordle to generate the word cloud the words that appear larger appear more frequently throughout the blog. The largest three words are first, year and teaching. This highlights the fact that this is my first year working as a qualified tutor. PGCE is also a prominent word although I expect this to be significantly smaller next year. I completed the Professional Graduate Certificate in Education in June and qualified as a teacher. A lot of my posts between February and June referenced ideas that I’d learnt or tried out as part of my teaching placement. Other words that stand out are: ideas, lesson, students. used, using, used and tool. This has revealed a lot about the way that the blog has been used. ‘Gemma Teaches’ was created with the primary intention to be used as a lesson idea/resource sharing site. The fact that these words appear regularly indicates that the essence of the blog has been maintained throughout the year. Other word that stands out in the word cloud are ICT and software. I have always had a keen interest in ICT and started an MSc in Multimedia and E-learning this September. Through Teach Meet sessions on the MSc and by collaborating on-line with other educators I have discovered a wide variety of education based software. As there is another year and a half before I finish the MSc I will hopefully continue to discover many more electronic delights that I can share with you all. From looking back at my blog posts for the last year I’ve learnt a lot about myself; my life moves at lightning pace, I’m always thinking about where to go and what to do next, whether this is an educational course like the CELTA or an MSc or a new career path such as I.T. Teacher, Employability Skills Tutor or Learning Mentor. As I’m constantly looking for the next thing I’ve never really taken the time to sit back and reflect on my life and everything that I’ve achieved and the relationships that I have built therefore I am really enjoying the chance to reflect on my year. This entry was posted in Reflection by Gemma H. Bookmark the permalink.